Defect's only good build currently is based around the card "All For One". That's it. That one blue card, assuming you get to build around it, is the only "good" deck the class has. Which is problematic because the class is basically evenly split into 6 different arch-types where most of the support doesn't overlap well. And it's a blue card so you may never see it until it's way too late. Orbs as a mechanic are a dumpster fire. Gaining extra orb slots is actively bad, none of the orbs are good build around decks, all of the orb decks are very inconsistent to build, and Focus as a mechanic simply doesn't work without Biased Cognition, which is a freaking orange. A good orb deck is a unicorn, because all of the supporting mechanics are active failures that need to be fundamentally reworked. Orbs, the actual orbs themselves, probably should get a rework. The power deck is not a thing at all. All the cards that say "each time you play a power" or "by how many powers you've played this game" are just bad. Because there are literally no common powers you want to play in the power deck. At the same time the 3 best powers are all Orange, and only Echo Form out of those 3 is actively at a power level that makes up for playing it. Since the good powers are purely parasitic, and the two best powers cost 3 mana and are orange, the power deck literally is just the absolute hardest of the arch-types to attempt. Keyword: Attempt. To actively succeed with this archtype you are going to be spending 10-15 minutes in some battles farming HP off of Creative AI. Which is all it's good for. It's not one of the two best powers because it's a good card for winning fights. It's one of the two best powers because it lets you heal up to full once you've handily won a fight and have infinite time to stall. Echo Form is literally the only power in the power based deck that is worth playing other than Machine Learning and Repair, and ... that's just good_stuffs cards I would pick up in any build. Powers, for the Defect, are just not a build. In fact if I was going to try to fix orbs without completely reworking the mechanic, I would straight up rip out half of the powers and use those open slots to seriously buff orb decks. That's how bad the "play a lot of powers" deck is. It so bad I actively hope they kill it so they can buff other decks. I simply can't believe that the dev team that designed the Ironclad and Silent is the same dev team that built the Defect; because the first two are so good, and the 3rd is just so much of a mess I don't even know if they are going to have the kahones to release it this month. I now feel there is a realistic chance they actually delay until June just so they can try to fix the character before it ends up on the main branch, because it no worky. if you have enough focus and enough ice orbs you'll passively generate enough block to avoid taking any damage. More orb slots is better for frost orbs and worse for lightning orbs, probably. The other two orb types seem irrelevant. (or three really, since i think the only other noteworthy archetypes don't particularly care about orbs). lightning orbs are also good in the very early game. Its got a long way to go but I don't think its that much of a mess. A lot of the cards are fun to play with, and I like the visual effects. I imagine people will like it the way it is now despite the critical flaws because it doesn't need to be good or appreciated by reddit to be fun. I have fun playing it dewspite its flaws. if you have enough focus and enough ice orbs you'll passively generate enough block to avoid taking any damage. Maybe in magical Christmas-Land. In the real world you can't spend 3 to 4 turns setting up while the enemy gets free hits on you. You just die to war of attrition that way. Its got a long way to go but I don't think its that much of a mess. 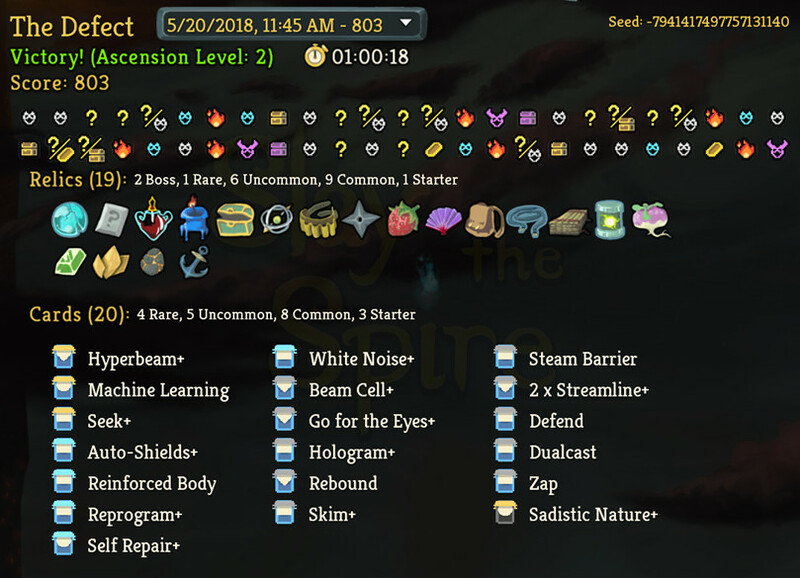 The Defect has one viable deck at high ascension and can't reliably build ANY deck arch-type. That is that much of a mess. I imagine people will like it the way it is now despite the critical flaws because it doesn't need to be good or appreciated by reddit to be fun. I have fun playing it despite its flaws. A lot of people want to be able to have some control over whether they win or lose a run. They like winning, and they at least prefer that the game appears to be "hard but fair". With the Ironclad and Silent you have that. Most runs at least have the illusion of being winnable, even if you don't get there most of the time. You don't get that with the Defect. You don't get that at alll. It's an RNG **** of a character that can't consistently build it's one good deck. I cannot stress enough that this is really not the case. The Defect can't build ANY deck consistently, but All For One has by far the highest win rate when you manage to build that deck. It's the only build with enough Burst Damage to be able to do anything. The Defect basically doesn't have a defensive deck. Frost was probably supposed to be it but there are so many moving parts that it doesn't work. And after that you've basically got Leap. You don't have a way to block enough damage on floor 3 with this character. The problem with orbs, in my opinion, is that their values are extremely low because of a card they deprecated within two days of release to the beta branch. That's how broken that one card was with orbs. All of their values make sense if you take Allocate into account. The problem is that Allocate got deprecated (aka removed entirely) but the values have never been adjusted to reflect that. And we have not gotten a replacement source of focus that makes up for losing that one card, so the focus strategy with orbs is just too slow. Frost Orbs really need to provide 1-2 more block, Lightning Orbs really need to do 2-3 more damage, and Dark orbs need to do 3-5 more damage per trigger. Those kinds of changes to the base values would go a long way to making some orb deck work, even if it was just Chaos_Evoke.dek. As is, Lightning orbs do piddling damage when you don't evoke them, Dark Orbs don't build up at anything close to a reasonable speed, and you just need too many Frost Orbs for it to be reasonable to set up. For people who don't know, Allocate was a card that gave you +1 Focus and -1 Str -1 Dex. This cost 1 mana and single-handedly broke orbs. It got nuked from orbit within 2 days of beta testing starting. here's a deck someone posted earlier in the day that they described as a "free win"
there are plenty of cards that help reduce the turbulence in the first few turns while you set up your combo (although an optimal deck will only take one or two turns to get your block to sufficient levels). Auto-shields, Glacier, Barrier, and Boot Sequence, for instance. relics can help take the pressure off the start of a battle as well. I think people will feel like they're able to win runs as the defect even without great RNG, especially at lower ascensions. I do agree that the defect is more combo-centric though, and as such RNG will probably feel like it plays a bigger part. I don't think a character like that is necessarily bad though, because it supports a different sort of playstyle. Welp I beat Ascension 12 and unlocked 13 on Ironclad. Bosses were the Guardian, the Bronze Automaton, and Time Eater. The Automaton was the hardest boss I could have fought on Act II, but I got lucky and got a 60 damage Whirlwind to wipe out his orbs on turn 2. I won that fight the turn after he hyper-beamed with like 6 health left. By contrast, I think Time Eater was the only boss I was going to be able to beat on Act III, so that was an extremely lucky pull. And I think the only smart decisions I made on Act III that required actual decision making were smoke-bombing a double Spiker fight, knowing from memory who to target with Spot Weakness, and choosing Writhe over 2 madness. The boss fight itself was just obvious plays except for the one turn where I played Reaper instead of Whirlwind (I didn't have enough health to withstand the attack he does after he purges, so I Reaper'd). Beat A-13 and it only took 3 tries after beating A-12. This is where I had pre-determined I was going to stop, because I don't want to have to beat A-14 until I'm sure no A-15 achievements are coming with the Defect. I paid 8 max hp into Neow to get the feed, paid even more into events (although some events also gave me some back), and I still ended up with 119 health in the final battle. Didn't even get to use the Lizard Tail. The final bosses were Donu and Deca and Red Mask + Bag of Marbles meant Bash actually worked. Donu died so fast (he's the one that buffs attack, while Deca does armor and dazes) that I won the fight with 64 hp left. I fully remember why I don't like Ascension mode. There are a whole bunch of runs that are just completely unwinnable, and you have to be resigned to that fact. I'm trying to get my Silent up to unlocking 14 too and I feel like RNG has more control over my run than I do. Yes, there are some runs where it's obviously my fault that I lost. But there's a lot of runs where I feel like I made all the right decisions and the game was just unwinnable because it's Ascension mode. I can't do that because I'm a completionist. Well I managed to make an Unceasing Top discard Silent that could play 8+ cards a turn and still beat Time Eater. Don't get to say that too often. Was a pretty good run. The only cards I picked up on Floor 3 were Leg Sweep+ and Dark Shackles. Figured they would help against boss (they did). None of my potions mattered after Act I. A Ghost in the Jar in the final fight was something I thought might have an impact, but he didn't do enough damage after that to be able to kill me through the Lizard Tail anyways if I hadn't used it. Last edited by mjack33 on Fri May 18, 2018 9:06 pm, edited 1 time in total. The above is notable for being the first run where I took the Portal and won. EVER!!! Found it halfway through the last floor. My policy of course is to always take the portal no matter how stupid it is. <- Most of the time it's actually pretty stupid. Here's my Defect Unceasing Top deck. I was able to save both my Double Energy+ for the second form of the Woke Bloke (the first one got me to 16 energy thanks to Echo Form) to take an epic turn and kill it before any Voids were shuffled into my deck. Well another one down, a bunch more to go. This run is a testament to how powerful Molten Egg, Nilry's Codex, and Paper Krane are as relics. But especially Paper Krane. I am not at all joking about it when I say that that single relic is the most powerful relic in the game without contest. My deck is absolute trash and would have lost to the Awakened One if I hadn't gotten Paper Krane on the last floor. But since I did I took a total of 11 damage for the entire boss fight. After playing 4 powers. And aside from one in six cards causing weakness, my deck is terrible. This is the only run past Ascension 2 where I've won with >30 cards in my deck, there is no cohesive theme, and it just doesn't do damage. There is no reason it should be able to win a 10+ turn boss fight while only taking 11 damage. Paper Krane is just absolutely busted. The highest attack the Woke Bloke does is 44 damage, and blocking 22 with After Image in play isn't *too hard*, so there was no danger to any of the fight once the Cultists were dead. The scariest parts of the run were actually the first floor (because I did 3 elite fights) and the 2nd floor (I was on less than 20 hp dead for 4 trash mob fights in a row and then went into the Collector boss with ~40 health). Just bought the game and played for the first time today. Pretty freaking sweet. I got self-forming clay to give me block evertime I lost hp and a fan that gave me block every time I attacked 3 times in a turn. I decided early on to go full aggro. Headbutt is a pretty sweet card. Ok damage and you get to put a card from your discard on top of your draw pile. With a couple of decent 0 cost cards I wouldn't mind adding to any hand, it had plenty of worthy targets. Battletrance- draw 3 for 0; Flex- Gain 2 strength for the turn for 0; Anger+ - ok damage and creates a copy of itself. It was especially good with Doubletap+. Either Double headbutt and guarantee two good cards, preferably with synergy or bring back double tap and one card you'd like to play twice next turn. I think when you double tap head but it can actually bring back itself to keep things going. I might be wrong though, on account of I had 2 head butts and one might have been discarded some other way. I expected berserk to good work with headbutt, but my deck was too bloated to see it happen. My fatal mistake was opening up the creepy book and spending my dwindling hp to read further and further. I just really wanted to see what was in that book. I got the book and died against the 2nd boss in the next room. I agree that the Defect's archetypes are all over the place, but that actually compels me to play the class even more because I want to see if I can build one anyway. And when everything else fails, there's always the "recur a couple of Streamlines" plan. The only relics that make it extremely easy to win runs by themselves mostly (but not completely) ignoring your deck composition are Paper Krane in Silent and Necronomicon in Ironclad. Those imo are the contenders for top relic in the game. It's hard for me to order these. But these would all be solid contenders for the 3rd spot imo.